Foodie Friday for "'One Spring Day"
Well, that's what I did today (no, not eat paste!). The Cutting Cafe has just come out with the most adorable new set called One Spring Day. 90 images! Some colored, some ready for you to print and color. I don't have all the new programs for my computer yet, (grrr..it's a conspiracy..new computer, have to buy all new stuff) so I couldn't transfer the images individually...no problem. I just printed out some of the fun colored images and then I cut and pasted. Pure fun, no stressing about coloring out of the lines. A little sponging on the background is all the ink I added by hand. I popped the ladybug, kite and birdhouse on the right up on dimensionals, added the buttons and called it done. Super fun, super easy for when you need a quick card or you have little ones who just want to "cut and paste". Here's a super easy recipe for One Spring Day...bursting with color, flavor and crunch this is almost a meal in itself yet not at all heavy. A nice light cornbread and grilled chicken paired perfectly with it. Thanks Paula Deen! Trim off large leaves and tough stalks from the broccoli. Wash thoroughly. Cut flowerets and peeled stems into bite sized pieces. Place in a large bowl. Add crumbled bacon, onion, raisins, and cheese. In a small bowl, combine maonnaise, vinegar and sugar. Stir well or use a whisk until well combined. Add to large bowl, toss. Add tomatoes, toss gently. Sprinkle with toasted walnuts, if desired. Refrigerate until ready to serve. Have an awesome Spring Day! I know it's Thursay...or is it? ;-) DH had a day off yesterday (I use that term loosely...he mowed and sprayed the lawn, cleaned our big wooden front entry doors, installed the new keyboard for the desktop (in our office, it requires yoga moves) and grilled the chicken for dinner! Is he a sweetheart or what?) I lose track of the days when he has his mid-week day off. Since we live in citrus country, I couldn't resist this week's Moxie Fab Citrus Celebration Tuesday Trigger. Isn't this orange, lemon and lime combo refreshing and fun? 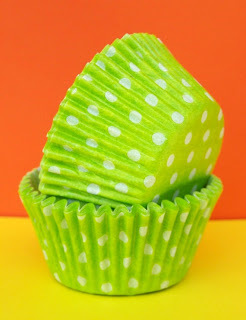 I love those polka dot cupcake liners! I started with a base of PTI Lemon Tart then layered it with some DP from one of my favorite paper packs, DCWV Citrus Collection. The bird is cut out and popped up on dimensionals. A bit of stitching, some hand gathered ribbon, a few fun buttons, and some distressing with scissors and ink to soften the edges and done. Thanks for stopping by my paper playground...don't forget to comment for the blog candy here. It's good to be back!